Fans of the Fallout 76 video game gather at Camden Park. Photo courtesy Brandon Helmes. 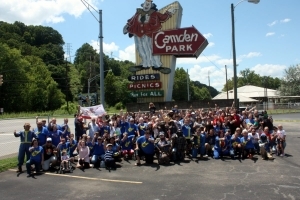 Camden Park is a 26-acre amusement park located east of Huntington, West Virginia, in Cabell County. Established in 1902 as a picnic ground by the Camden Interstate Railway Co. to increase ridership, Camden Park is one of a handful of such parks that remain in the U.S. The park was built in a wood along the banks of Twelvepole Creek between Huntington and Ceredo, West Virginia. The prehistoric Camden Park Mound remains in the parks picnic area. The park is typically open six days a week from late May to early August, with a more limited schedule in late August, and select dates in September and October. Whereas most trolley parks were located at the end of trolley lines, Camden Park is unusual in that it was built where riders traveling between Huntington and nearby cities would stop to change lines. Not long after opening, the park gained a carousel and other roadside attractions. The park is home to more than 30 rides and attractions, including a full-size traditional wooden roller-coaster, the Big Dipper, and other vintage rides. Camden Park also appears as a locale in the Fallout 76 video game.